He was born in Sheffield in 1757, son of Seth Eggleston and Rachel Church Eggleston. Like many of his generation, his father was born in Westfield and emigrated west – as his father may have done before him. Many Revolutionary War veterans were 3rd or 4th generation descendants of the Puritans who had landed in Boston in the 1630’s. About 200 Lenox residents are listed on the Revolutionary War rosters. Not all would have served as long as Major General Paterson or Major Egleston, but it was clearly a town with strong patriot sympathies. Azirah must have been very committed to the Revolution since he enlisted as a Private in April 1775 at age 18 and participated in many crucial battles and left the service as a Major. 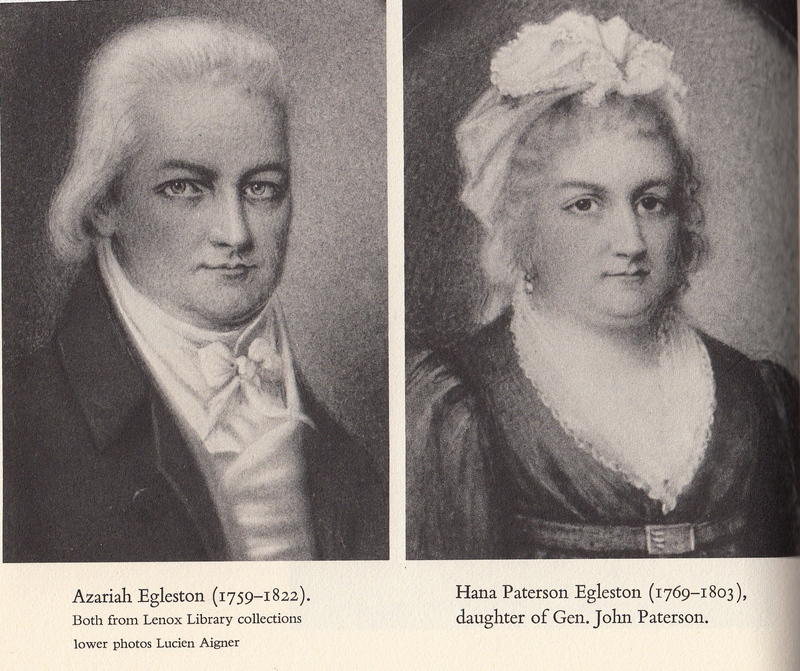 Upon his return, he married the daughter of the local hero, Major General Patterson . When his father-in-law left for new opportunities in New York state, Azirah and his wife Hannah moved into Patterson’s handsome Federal style home which you can still see on Main Street. By 1806, he had become quite successful and bought the original home of town founder Israel Dewey which stood at the site of the current Birchwood Inn at Hubbard and Main. Azirah died in 1822 (age 64) and is buried with his wife Hannah who had died in 1803 (age 33). His grandson Thomas Egleston led an effort to erect a monument to Paterson and Egleston(unveiled in 1892) and to have Major General and Mrs. Paterson brought to Lenox and re-interred at the cemetery at Church on the Hill.